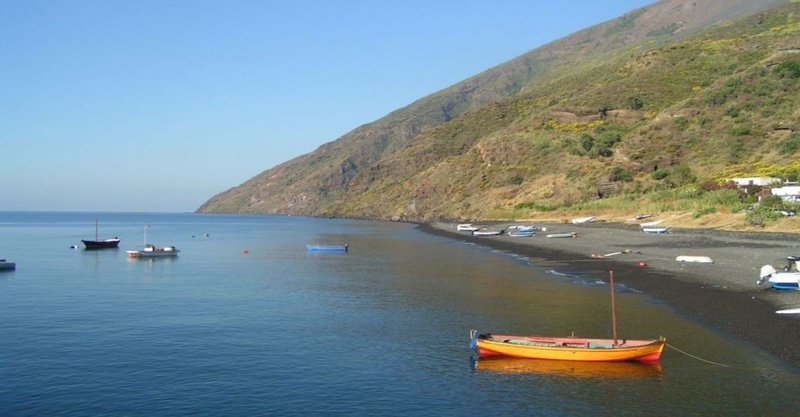 Stromboli offers many opportunities for both hiking and trekking enthusiasts and for those keen on exploring the seabed. For those unwilling to tackle the ascent to the volcano on foot, they can always enjoy the eruptions of the craters by booking a night boat trip to the Sciara del Fuoco, or choosing less steep paths to reach the Observatory. A fascinating hike along a mule track that starts from Piscità and goes beyond the street lights of Punta Labronzo, where the Civil Protection Department ;monitors, takes you closer to the crater. 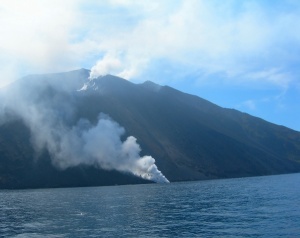 Punta Labronzo is the most easily accessible point from which to observe the Sciara del Fuoco, the steep slope on which the desolate and incandescent rocks spewed from the crater roll into the sea creating a swirl of black, impalpable and windswept powder. You should be prepared for at least two and a half hour walk to and fro, from the town. You can drive up to Belvedere, at a height of 290 meters above sea level, or you can continue to the summit of the volcano but you are required to be accompanied by a guide. 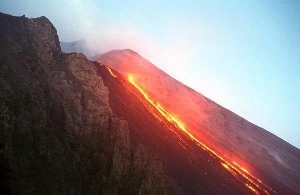 It is possible, with a guide, in three hours to reach the summit of the volcano (Vancori, 924 m) and from there, in complete safety, to assist the unique and exciting spectacle of the Ascesa crater explosions. The eruptions are especially impressive watched in the darkness of the night. 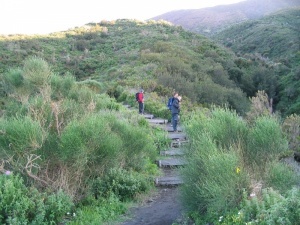 It is recommended to hike in the late afternoon and return at night. 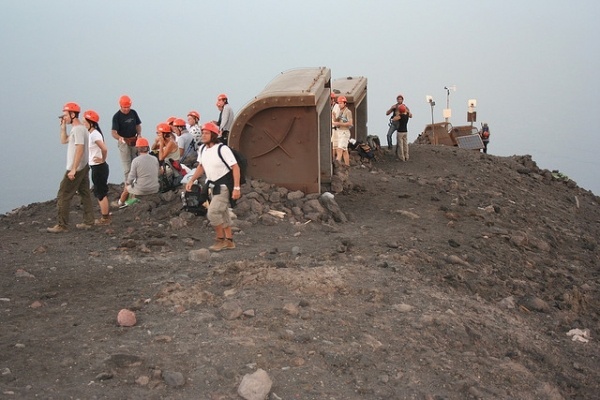 The hike to the summit of the volcano takes about 4 hours (round trip) and in some areas is quite tiring. It is, therefore, recommended for good walkers. 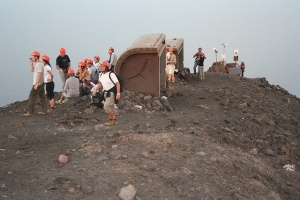 To make the hike to the crater it is necessary to book an authorized guide. For the ascent, we recommend standard hiking equipment; hiking boots are preferable to sneakers. It is possible to rent everything you need. It is also important to take three torches, a pair of long trousers, a bottle of water, energy bars and a spare T-shirt. Don’t forget an anorak or fleece for the summit, where the temperature can drop. 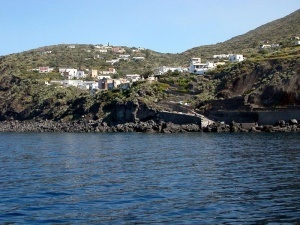 The hike to Stromboli’s crater is a unique and fascinating experience which will allow you to admire a breathtaking natural phenomenon. Along a path of rare beauty, with unforgettable scenery, one comes into sight of one of the world’s few active volcanoes. The persistent explosive activity is directly observable from a few hundred meters away: a succession of loud explosions which project incandescent lapilli into the air make way for a spectacle that makes one forget the fatigue of the recent journey. The trail, designed for effortless walks without the accompaniment of guides, connects S. Vincenzo to Punta Labronzo through virgin areas of the mountain. It is possible to take an annular route, which returns to the stone road that connects Semaforo Labronzo to the hamlet of Piscità. The trail averages a width of one and a half meters and ensues, mainly in the central stretch a range of altitudes that reach 200 to 250 meters on a bed of sand and rock that is only seldomly inclined. To render the journey more pleasant and to enjoy the panoramic views and the shaded areas, the path is equipped with stop-offs with wooden tables and benches. The beginning of the trail which starts at an altitude of 100m can be reached from Piazza S. Vincenzo along the road near the church. 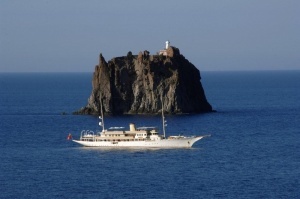 If the water is calm, the boat trip which takes you to see Stromboli from the sea and admire the spectacular Sciara del Fuoco can be quite evocative. The trip starts at dusk from the pier at Scari and the anchor is lowered in front of the Sciara del Fuoco, keeping a safe distance of at least 400 meters. From here you can watch the volcanic eruptions which, with an amazing regularity, spew out the flame red lapilli against the black of the night, creating magnificent natural fireworks (duration of approximately one and a half hours). 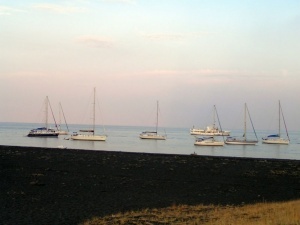 This is perhaps the best way to appreciate all the different aspects of this island. Departure from Scari in the morning (duration approximately 3 hours). 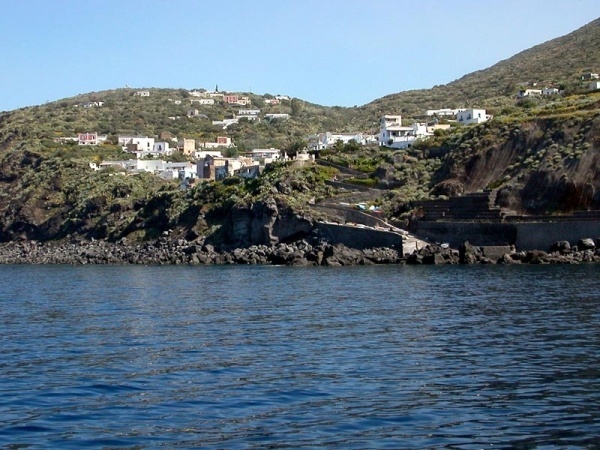 You can tackle the boat trip around the island either with a small hired boat (if you like to "do it yourself ") or with the guided tour (if you prefer to rely on expert sailors of the island). During the circumnavigation, a visit to the small village of Ginostra and a dip at Strombolicchio, where the blue of the sea takes on infinite nuances, should not be missed. 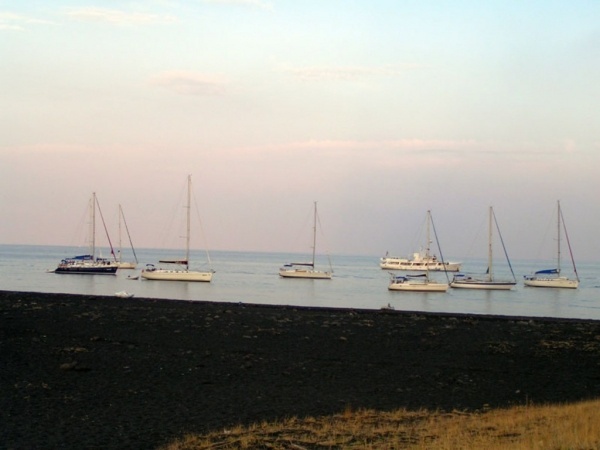 Those who want to enjoy the charm of Stromboli should, at sunset, meander along its many moonlit streets, and allow themselves to be enveloped by the aroma of the island. Keep in mind that the streets of the island are devoid of electric lighting and hence, conserve all the rich flavor of Aeolian history. It is a small island in the middle of the sea that juts out like a medieval castle, a kilometer and a half north of Stromboli. In 1926 a beacon was installed there to aid in navigation. 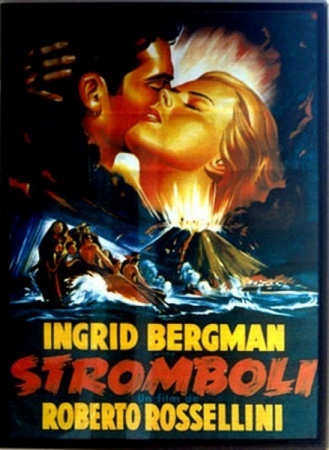 An ancient legend, passed down to us by oral tradition, narrates that Strombolicchio is nothing more than the cork of the Stromboli volcano launched into the sea by a violent eruption. It is actually a neck, that is to say, the solidified inner portion of an ancient volcanic structure which has been slowly eroded away by the waves and the wind. This ancient volcano, which has been dated to between 360 and 200 thousand years, probably constitutes the first phase of the geological evolution of the entire volcanic complex that, is the Stromboli volcano. Today Strombolicchio is home to a large solar-powered lighthouse.